Starring Jennifer Lawrence, Josh Hutcherson, Liam Hemsworth, Woody Harrelson, Elizabeth Banks, Willow Shields, Stanley Tucci, Lenny Kravitz, Donald Sutherland, Wes Bentley, Amandla Stenberg, Alexander Ludwig, Isabelle Fuhrman, Paula Malcomson, Willow Shields, Toby Jones, Leven Rambin, Jack Quaid, Dayo Okeniyi, Jacqueline Emerson, Kimiko Gelman, Nelson Ascencio and Brooke Bundy. Screenplay by Gary Ross, Suzanne Collins and Billy Ray. Distributed by Lionsgate. 142 minutes. Rated PG-13. The Hunger Games trilogy of novels by Suzanne Collins is the biggest literary sensation since… uhh, Twilight. Or perhaps The Girl with the Dragon Tattoo. So, it’s no real big surprise that the movie version is the most eagerly awaited literary adaptation since… uhh, Twilight. Or perhaps The Girl with the Dragon Tattoo. Of course, neither of those books became all that great movies. And the last few Twilight films and Dragon also have been box office disappointments. However, The Hunger Games the movie is a pretty spot-on example of how to make a current film blockbuster. Which is kind of surprising, because the basic storyline movie is just a bulked-up rip-off Shirley Jackson’s classic short story “The Lottery” with a bit of The Running Man and Death Race and even The Blue Lagoon mixed in for flavor. And yet it still mostly works. Mostly works very well. The Hunger Games is not particularly original, but it steals ideas with great panache. In case you’ve been on a desert island for the last few years, The Hunger Games takes place in a not-so-distant future in which most of the money has been siphoned off to the rich people. The poor are farmed off into colonies. Every year, two children from each colony – one boy and one girl between 12 and 18 – is picked by lottery to participate in the titular games. The twenty-four are taken to a forest and set loose for a fight to the death. The last person standing will be the winner. The whole thing is on television, a deadly and extremely popular offshoot of reality TV. 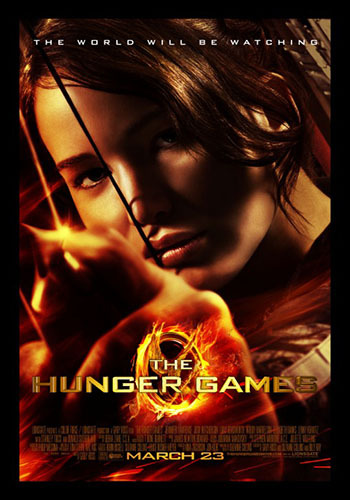 Jennifer Lawrence plays Katniss, a young girl from territory 12 who goes in stead of her younger sister, who loses the lottery. She is sent to the capitol city with a boy from her town who has had a crush on her (Josh Hutcherson) to train and then they bond together to try to survive. While the games and the young kids are very intriguing, the members of the rich futuristic empire seem way over the top and overly plastic – particularly a goofball TV host (Stanley Tucci) and an overly upbeat publicist (Elizabeth Banks). That is not a problem of the actors, it’s just a slight flaw in the story. However, the main story – the characters, the love story, the games – is surprisingly gripping. The Hunger Games is pulp fiction for the masses, but it’s damned good at it. Copyright ©2012 PopEntertainment.com. All rights reserved. Posted: April 10, 2012. Tags: Alex Diamond, Alexander Ludwig, Amandla Stenberg, Billy Ray, Brooke Bundy, Dayo Okeniyi, donald sutherland, Elizabeth Banks, Gary Ross, Isabelle Fuhrman, Jack Quaid, Jacqueline Emerson, Jennifer Lawrence, Josh Hutcherson, Kimiko Gelman, Lenny Kravitz, Leven Rambin, Liam Hemsworth, movie review, Nelson Ascencio, novel, Paula Malcomson, PopEntertainment.com, Shirley Jackson, stanley tucci, Suzanne Collins, The Girl With the Dragon Tattoo, The Hunger Games, The Lottery, toby jones, twilight, Wes Bentley, Willow Shields, Woody Harrelson, Young Adult. Bookmark the permalink.